The U-T reported this morning on San Diego city government’s failure to shut down illegal medical marijuana shops. To be clear, there are currently no legal medical marijuana shops in the city. The case is instructive on the results of the failure of the rule of law, including the failure to pass implementing laws that unwelcome, but legal activity to proceed. Councilmember Ed Harris wants a process that shines the light of transparency on the efforts to close the illegal shops. The proposal comes as the abundance of illegal dispensaries has begun adding turbulence to the already complex approval process facing applicants trying to open the city’s first legal pot shops. In both Pacific Beach, whereas many as 25 illegal dispensaries operate, and Mira Mesa, where there are roughly half a dozen, community leaders say the illegal pot shops are tainting the process of approving legal ones. I can only hope that we can speed the process of allowing the legal permitting of dispensaries, so that neighborhoods feel that they are protected by law and have a voice in where the dispensaries are located. My concern is that the slow wheels of bureaucracy will have the same effect as the illegal tactics of Filner, only illegal dispensaries operating. Lack of clarity in the law, failure to allow a path ahead for what should be legal activity and a failure to enforce the law have led to this mess. Making matters worse, the California state legislature has again failed to pass a bill that would impose statewide uniformity on medical marijuana and further normalize the business. 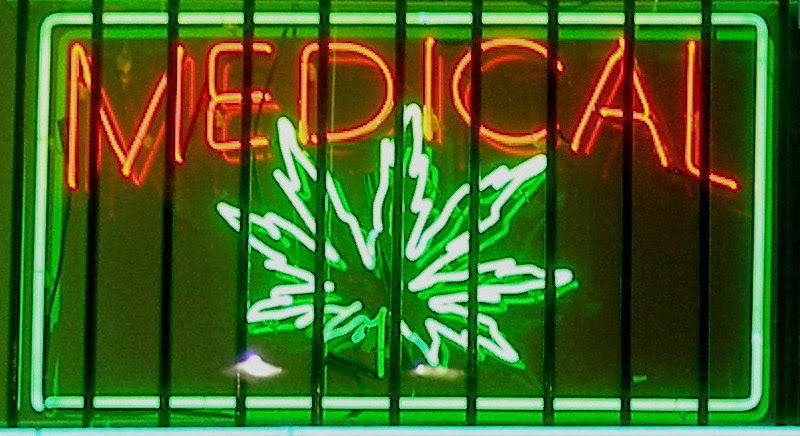 Photo credit: “Medical-marijuana-sign” uncropped image from Laurie Avocado. Licensed under CC BY 2.0 via Wikimedia Commons. Lots of military members angry at Ferguson law enforcement over tactics and paraphernalia heavier than what they used in Afghanistan. See all the tweets. Professor Perry has a host of great links on the Ferguson MO issue. My favorite is from Nick Gillespie: Let’s Make Cops Wear Cameras – “Everyone behaves better when they’re on video.” The situation Ferguson also has to do with the rule of law. KTCat continues to skewer the administration over its failure to deal with ISIS. Guess what folks, there is and has been weed selling in your hood for decades. The only problems have been nothing more than perception and fear generated by religious and political power brokers. The only reason laws are changing is because some of you (good upstanding white folks) and your children became victims of some rediculously punative laws. There are now formal PACs opposing legalization. They exist for monetery reasons only. I’m glad the the libertarian side of the right wing supports freedom and liberty. Unfortunately ,the majority of conservatives won’t support legalization because of religious brainwashing.